The AZP63 is a sine wave/CMOS to LVPECL translator / buffer optimized for very low phase noise and additive jitter operating at 3.3V & 5.0V nominal supply voltages. It is particularly useful in converting crystal or SAW based oscillators into LVPECL outputs for up 1.2 GHz of bandwidth. 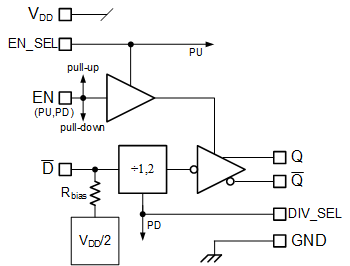 The AZP63 is a high frequency variant of a family of parts that provide options of fixed ÷1, fixed ÷2 and selectable ÷1, ÷2 modes as well as active high enable or active low enable to oscillator designers.